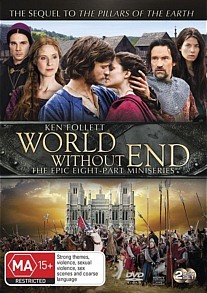 World Without End DVD Review World Without End tries to be Game Of Thrones but ends up being Downton Abbey instead. While certain set pieces and visual effects can be commended the story and the characters aren’t captivating whatsoever. Based on Ken Follett’s novel of the same name, World Without End is an eight-part miniseries starring Cynthia Nixon and Miranda Richardson set in 14th century England, and follows the lives of its citizens as their King prepares for the Hundred Year’s War against France. There seems to be an endless demand for historical dramas these days, and after the success of shows like Game of Thrones it’s no surprise. Here lies the biggest problem with World Without End; is feels like it’s trying to be too much like the HBO smash hit. The source material that it’s based off is far less substantial and exciting which causes the often gratuitous violence to feel out of place and rather surprising to see. There’s plenty of hanging executions shown in their full gruesome detail and a startling scene in which a soldier has an arrow pulled out of his arm for our enjoyment. It’s certainly impressive how they pulled off such realism in their gore but it’s all unnecessary. Acting is subpar throughout and the dialogue isn’t much better. Character’s reactions to particular events aren’t realistic and conversations are filled with words and slang that sounds a lot more modern than the era the show is based on. World Without End tries to be Game Of Thrones but ends up being Downton Abbey instead. While certain set pieces and visual effects can be commended the story and the characters aren’t captivating whatsoever. I can recommend this for die-hard fans of periodic dramas but that’s about the only crowd I feel would be interested in this...unless you like a lot of gore.